Keywords: Qadimism; jadidism; Central Asia. This article attempts to answer two questions: how is the genesis of Islam in Central Asia and how is the dynamics of ‘ulama related to the fragmentation of qadimism and jadidism. There is no doubt that ‘ulama played important role in spreading Islam and Islamic civilization, including in Central Asia. They got involved in the process of diversification of Islamic teaching and contributed to the struggle against colonialism. However, with modernity the ‘ulama underwent fluctuative relation with each other. Diverse responses to modernity resulted in the diversity of ways of actualization in coping with social problems. The rise of jadidism that was reacted by qadimism constituted a modern phenomenon in Central Asia when the ulama attempted to respond modernity. The diversity of ways of actualization caused the relation between qadimism and jadidism problematic. On another occasion, however, the ulama could contribute to each other, especially when they shared the same interest. Abdulagatov, Zaid. “Wahhabism and Jadidism in Islamic Consciousness in Daghestan: Parallels and Contradictions”, Central Asia and the Caucasus, No. 6 (42) (2006), diakses 12 Mei 2017, http://cyberleninka.ru/article /n/wahhabism-and-jadidism-in-islamic-consciousness-in-daghestan-parallels-and-contradictions. Alvi, Farhat. “The Significant Role of Sufism in Central Asia” 16 (2012), diakses 25 April 2017, http://www.pu.edu.pk /uoc/mag/PDF-FILES/. Barr (al), Muḥammad ‘Alī. al-Muslimūn fī al-Ittihād al-Sufyītī ‘Abr al-Tārīkh, Vol. 1. Jeddah: Dār al-Shurūq, 1983. Bennigsen, Alexandre and Lemercier-Quelquejay, Chantal. “‘Official’ Islam in the Soviet Union” 7, No. 3, Religion in Communist Lands, 1979. Bosworth, Clifford Edmund. Dinasti-dinasti Islam. Bandung: Mizan, 1993. Dudoignon, Stéphane A. “Echoes t Al-Manar among the Muslims of the Russian Empire” dalam Stéphane A. Dudoignon, Hisao Komatsu, and Yasushi Kosugi, eds., Intellectuals in The Modern Islamic World: Transmission, Transformation, Communication, New Horizons in Islamic Studies. London; New York: Routledge, 2006. Egamberdiyev, Mirzahan., Turgunbayev, Yerlan., and Baigarayev, Nurlan. “Jadid Movement in Turkestan in the Late 19 and Early 20 Centuries,” World Applied Sciences Journal, Vol. 29, No. 9 (2014. Hitchins, K. “Jadidism,” in Encyclopaedia Iranica, n.d., diakses 20 April 2017, http://www.iranicaonline.org/articles/jadidism. Erşahin, Seyfettin. “The Official Interpretation of Islam under the Soviet Regime: A Base for Understanding of Contemporary Central Asian Islam,” Journal of Religious Culture, No. 77 (2005), http://web.uni-frankfurt.de/irenik/relkultur77.pdf. Haghnavaz, Javad dan Alerasoul, Saiedjamaledden. “A History of Islam in Central Asia,” American International Journal of Research in Humanities, Arts, and Social Sciences, Vol. 14, 2014. Hakim, Omar Abd al. Muslims in Central Asia and The Coming Battle of Islam, n.d., diakses 25 April 2017, https://azelin.files.wordpress.com/2010/08/abu-musab-al-suri-muslims-in-central-asia-and-the-coming-battle-of-islam.pdf. Hamim, Thoha. “Respons Bangsa-bangsa Muslim terhadap Penjajahan Politik Rusia di Asia Tengah”, Marâji: Jurnal Ilmu Keislaman, Vol. 1, No. 1, 2014. Hamka, Islam di Asia Tengah dan karya Agustinus Wibowo, Garis Batas: Perjalanan di Negeri-negeri Asia Tengah. Jakarta: Gramedia, 2011. Hitti, Philip Khuri. History of the Arabs (Jakarta: Penerbit Serambi, 2005. Kanlidere, Ahmet. “The Trends of Thought among the Tatars and Bashkirs: Religious Reformism and Secular Jadidism Vs. Qadimism (1883-1910)”, Journal of Central Asian & Caucasian Studies, Vol. 5, No. 9, 2010. Kemper, Michael and Shikhaliev, Shamil. “Qadimism and Jadidism in Twentieth-Century Daghestan”, Asiatische Studien - Études Asiatiques 69, No. 3, Januari 18, 2015/ diakses 27 April 2017, http://www.degruyter.com/view/j/asia. 2015.69.issue-3/asia-2015-1009/asia-2015-1009.xml. Khalid, Adeeb. “Being Muslim in Soviet Central Asia, or an Alternative History of Muslim Modernity”, Journal of the Canadian Historical Association, 18, No. 2, 2007. Khalid, Adeeb. “Jadidism in Central Asia: Islam and Modernity in the Russian Empire”, ISIM Newsletter, 2, 1999. -----. “Ulama and the State in Uzbekistan”, Asian Journal of Social Science, Vol. 42, No. 5, Januari 1, 2014. -----. Islam after Communism: Religion and Politics in Central Asia. Berkeley, California: University of California Press, 2014. Khawand (al), Mas’ūd. al-Aqalliyyāt al-Muslimah fī al-‘Ālam: Intishār al-Muslimīn fī al-Duwal wa al-Buldān ghayr al-‘Arabīyah wa Ghayr al-Islāmīyah. Beirut: Universal Company Publisher, t.th. Lapidus, Ira Marvin. Islamic Societies to The Nineteenth Century: A Global History. Cambridge: Cambridge University Press, 2012. -----. Sejarah Sosial Ummat Islam. Jakarta: RajaGrafindo Persada, 2000. Lazzerini, Edward J. “Beyond Renewal: The Jadīd Response to Pressure for Change in the Modern Age” dalam Jo-Ann Gross (ed.). Muslims in Central Asia: Expressions of Identity and Change, Central Asia Book Series. Durham: Duke University Press, 1992. Maḥmūd, Ḥasan Aḥmad. al-Islām fī Āsiyā al-Wusṭā: bayn al-Fatḥayn al-‘Arabī wa al-Turkī. Kairo: al-Hay’ah al-Miṣrīyah al-‘Āmmah lī al-Kitāb, 1973. Maraş, Ìbrahim. “A Critique of Method in Religious Education in the Post-Bolshevik Revolution Tatar Madrasas: Tradition or Modern?”, Journal of Islamic Research I, No. 2 (Desember 2008. Mughni, Syafiq A. Sejarah Kebudayaan Islam di Kawasan Turki. Ciputat: Logos, 1997. Olcott, Martha Brill. “Sufsm in Central Asia: A Force for Moderation or a Cause of Politicization?,” Vol. 84 (dipresentasikan pada The Carnegie Papers, Washington DC: Carnegie Endowment for International Peace, 2007), diakses pada 12 Mei 2017, http://carnegieendowment.org/files/cp84_olcott_final2.pdf. Pahl, Jordan. “Islam in Central Asia: A Religion and a Heritage”. Presented at the Young Historians Conference, Portland State University, 2012. Sharīf (al), Muḥammad b. Mūsā. “Ulamā” Āsiyā al-Wusṭā (al-Turkistān) bayn al-Maḍī wa al-Ḥāḍir, n.d., diakses pada 25 April 2017, https://books.islamway.net/1/oqail/alshreef--9.pdf. Fawaid, Ah. “Qadimisme Versus Jadidisme Dan Dinamika Ulama Di Asia Tengah”. 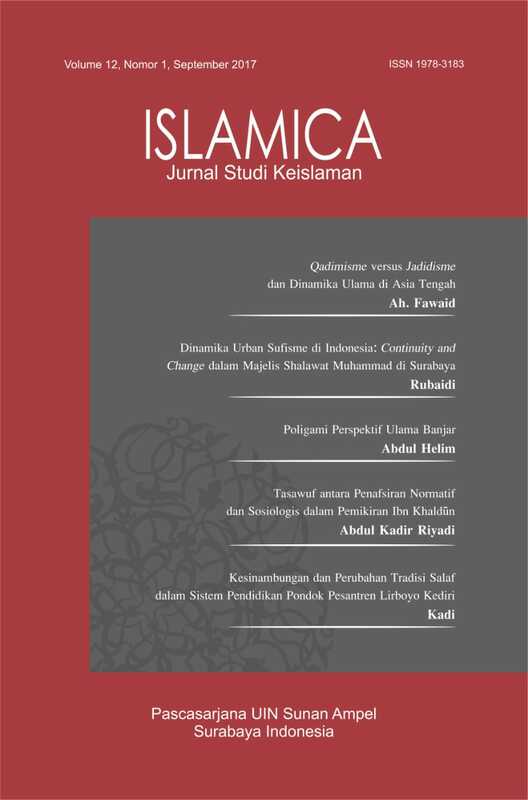 ISLAMICA: Jurnal Studi Keislaman 12, no. 1 (September 4, 2017): 1-21. Accessed April 21, 2019. http://islamica.uinsby.ac.id/index.php/islamica/article/view/353.